This is so easy to make and my kids love it. Feel free to substitute frozen broccoli for the spinach. Cook the macaroni and drain. Thaw the spinach. Mix all the ingredients together. 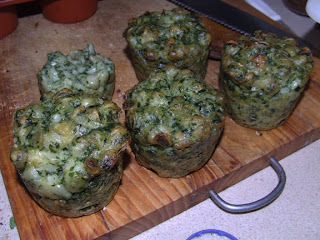 Pour into a loaf pan and bake at 350 degrees F for 1 hour or into individual muffin cups and bake for 30-45 minutes.